dans la peau de l’explorateur étranger, à la recherche, en réalité, de ses propres morts, de ses propres rites. En tapant à la culture de l’Autre, il fait résonner la sienne. C’est la démarche d’un cinéaste qui a choisi d’inventer une approche à la fois très personnelle, drôle, poétique et non conventionnelle de ce que l’ethnographie a eu coutume d’appeler l’Autre, le grand Autre à découvrir. En se mettant devant la caméra, sous les aspects de l’auto-dérision, Matthew Lancit prend le risque de s’exposer. Et c’est l’honnêteté de cette prise de risque que nous avons voulu récompenser. Un documentaire où l’ethnographie se trouve renversée, la tête en bas. “We pray to our ancestors but we do not worship them. You, you need an intermediary, the priest. But for us, our intermediary is the ancestor who is sitting next to God,” says Poundé, the old Cameroonian ethnologist, to the young Jewish director from Canada. And with this conclusive statement, everything becomes clear: the funerals in memory of “the dead who are not dead” organized several days or even years following the burial, the chants, brass bands and traditional dancers who accompany and punctuate the village rituals. The ancestral rites struggle to survive in a continuously westernized society of consumption by parading wealth and excess for all to see — even the dead. Funeral Season takes the viewer through the red dust of Cameroon’s laterite slopes and into the heart of the Bamileke country, where one funeral flows into the next. 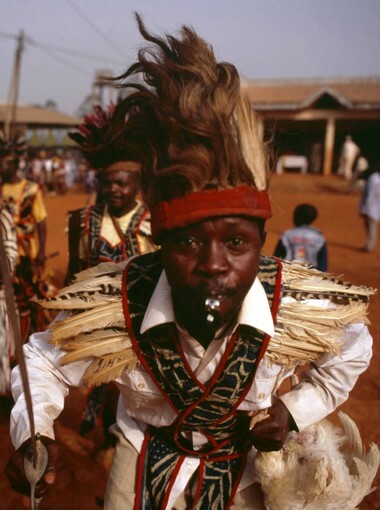 These death celebrations provide an opportunity to see elaborate costumes and masks, festive songs and dances, and lavish feasts, while illuminating the communal links which bind the Bamileke as an ethnic group and society. Along the way, the director befriends his guides and becomes increasingly haunted by memories of his own ancestors. At times, the dialogues alienate him from the locals; at other times they bring the two closer together. Like the dead and the living, they belong to two different worlds often mirroring each other. There is a lightness to be found in this subjective ethnographic film which imaginatively and symbolically turns the gazes of two different worlds upon each other.